Muda : Engagement and the extrinsic motivation in daily job. Engagement and the extrinsic motivation in daily job. Good day. I haven´t been very active lately, due to many things I have been doing this past weeks. But I promised to myself that I will be more active, so I can share experiences and some Lean & Six Sigma templates for free. So if you are interested on using them, you could actually save some time while surfing the net and go straight to that section and download the template. I know that is hard to find the right tool and template to use it for an specific situation. So, If you are interested on this, stay tunned and soon will start uploading interesting tools and templates for you to experiment, have fun and learn. Now, this week I wanna talk to you about an important topic that seem to be simple. But that actually is not. Many organizations do not know how to maintain engaged, motivated, happy to people in their headcount. Very often, organizations believe that conducting annual surveys on engagement will actually help to understand, and identify the gaps that need to be filled to increase engagement. And too often, that is far from being the solution. Although, an annual survey is a good start, I truly believe engagement happens on a daily basis. Every small activities we do every day, have a massive impact on motivation and engagement. This comes to the table due to the fact that I heard some days ago, someone talking about attrition or (Labor turnover as it is also known) in the US. Remember that I´m located in Mexico City, but very often, have contact with colleagues in the US. This person, was referring to the low attrition we have in Mexico City and saying that basically in Indianapolis, where he is located, is very hard to maintain a very low Labor Turnover rate. The explanation he was giving is because his facility was located next to other facilites that actually were inside different industries. But mainly because if you looked for a job, you could find it, eventhough the salary would be almost the same. Sometimes workers left because they were offered 50 cents or even 1 more dollar. 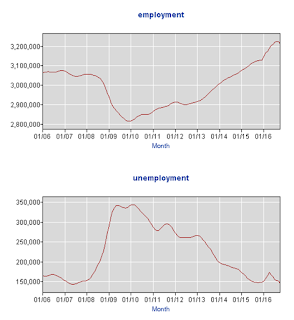 So basically he was complaining because, according to him, employment was good in the region and If a job didn´t like you, basically could find another without much trouble. So, first I decided to look a little bit to see if that was right. 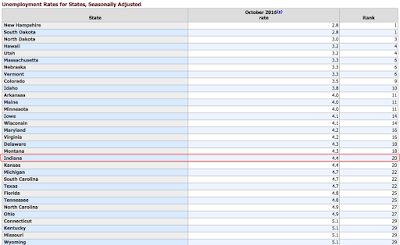 If the unemployment rates where low in Indiana. 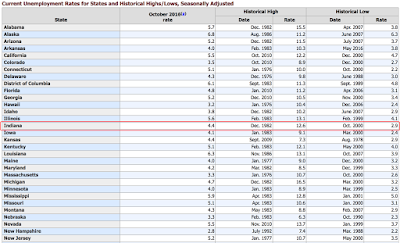 Googling found that the department of labor in the US have a very cool table with statistics about divided by states. And you can actually see the actual rate, and the historical high and low. To grasp an idea of the variation on the process. 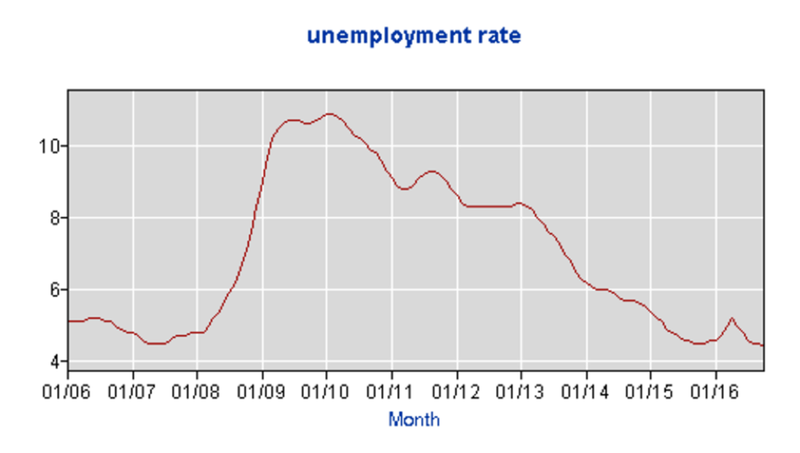 It is in fact true that there is low un employment in that zone. Fig. 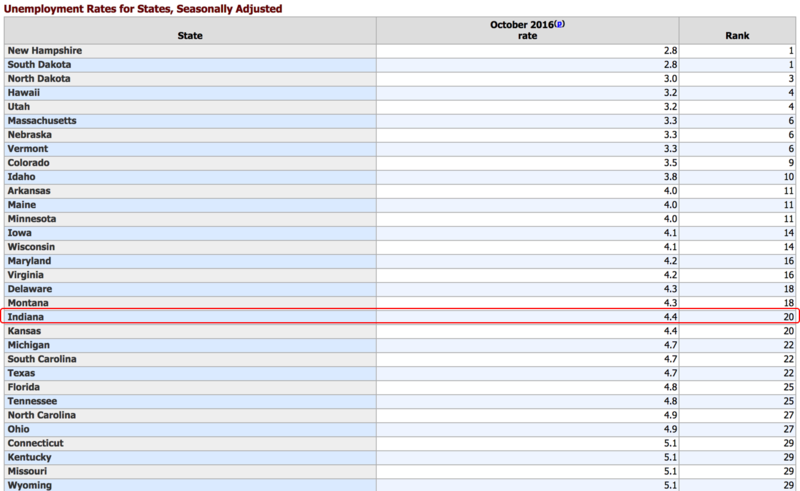 2 Unemployment Rate by state. Actual, max & min. 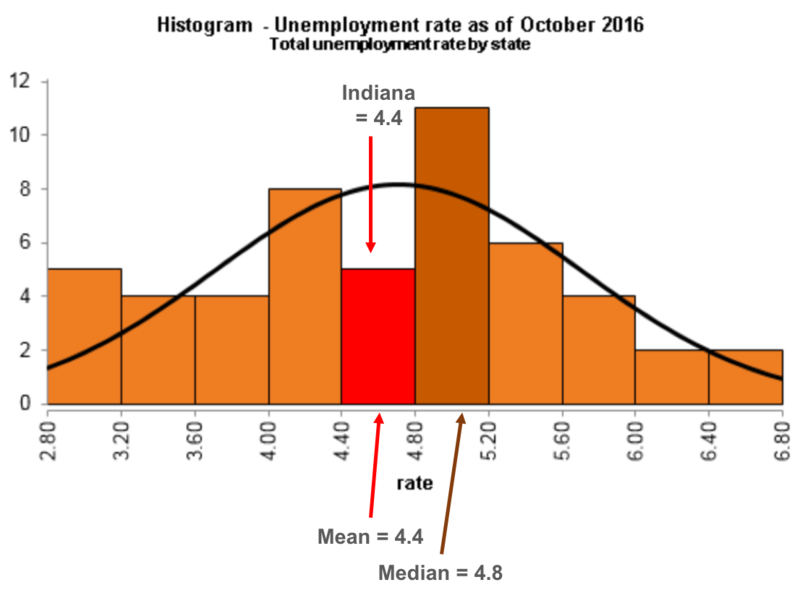 However, if we look at the histogram we can see clearly that Indiana is no better than the rest of the country, is about the mean. Also the Histogram on employment rate, shows that Indiana performance is around the mean. Fig. 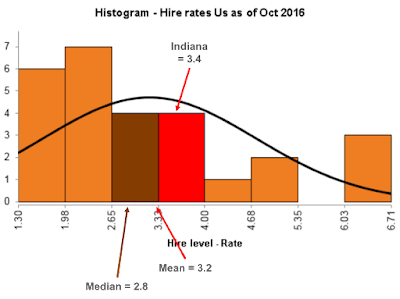 4 Hire rates US Oct 2016. 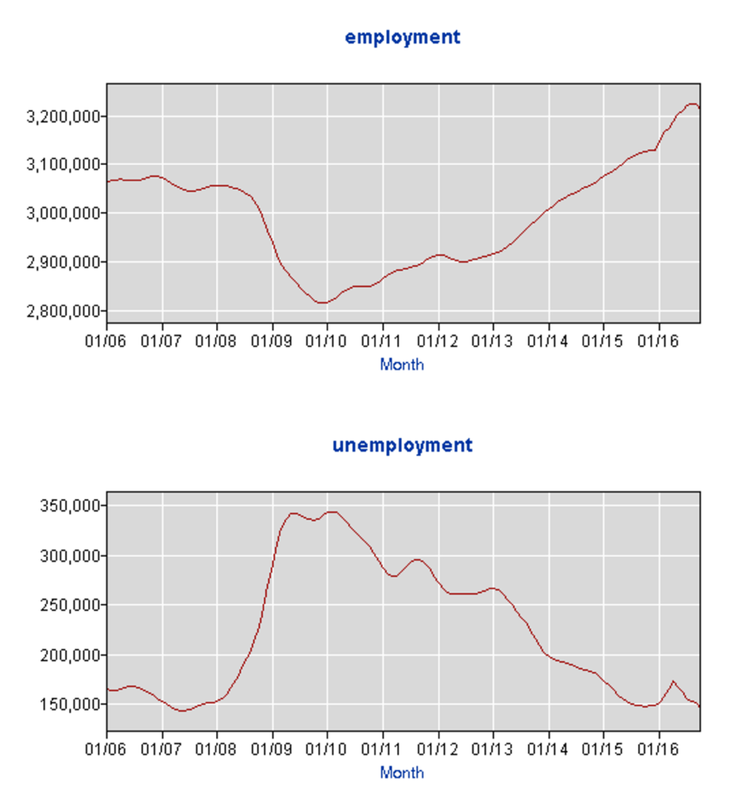 Source: Department of Labor US. The run charts show however that Indiana is getting better compared to previous years. 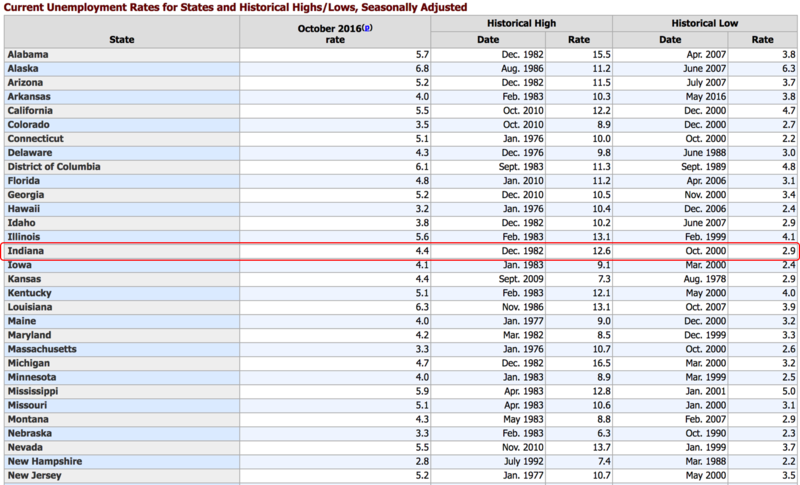 But even though things are getting better in recent years, looks like Indiana is no different to other states. 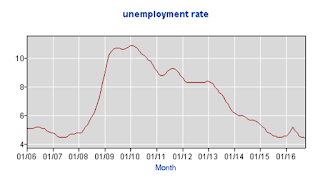 But it is true that as employment rates is getting better and unemployment is getting also lower, that combination might suggest that this guy has a point. Probably isn´t a problem specific to Indiana, but to the whole country. Remember that I live in Mexico and tried to use data to validate and get a conclusion on this subject. So if this in fact is getting worse or better, What can this facility do to solve this problem? A lean approach to this problem. Engagement is a people´s problem. There is no surprise to find that some people will eventually loose stamina on the long road if they find no motivation, but to get a pay check every month. I have heard that having a job, and getting a paycheck every month should be enough. I have heard that should be enough motivation to get up every morning and go to work. How ever, we know is not that easy. Even though we should be thankful for having a job, it´s almost natural to loose interest, stamina or motivation if we only have extrinsic motivation to do things. In this case it is very important to distinguish extrinsic from intrinsic motivation. Extrinsic motivation is the kind of reward or recognition a worker gets in the form of gifts, bonuses, awards, etc. A raise is also a motivation of this kind. So, what´s wrong about it? everybody wants a raise right? While might be good and even necessary and healthy to get raises, bonuses, awards or so, the problem is that the effect don´t last long. The excitement and energy that strives from this kind of awards tends to fade on the long road. The reason is that our brain and mind gets used to it. It adapts to the changes we have in our lifes and soon, will accept this new income or raise as something natural. Something normal. And eventually will go back to the old state of low motivation to perform. That´s how we are designed. It is completely normal and is good for businesses that now we know about it. So, what shall we do about it? Accept it and move on? Live with a high attrition rate in our businesses? NO. There is something we can do about it. Daniel Pink, Best selling author of Drive, The surprising truth about what motivates us claims that there are 3 things we can do to drive Intrinsic motivation, the kind of motivation that lasts longer. The first is autonomy. Grant autonomy to our workers. Let them decide what´s the better way to do their work. What ideas can they bring in order to improve? How can they work with management together and improve/solve problems at their jobs? Involving workers in daily problems is a good start. Is even better to involve some of them in solving bigger problems the organization is facing. Two key things must be considered here. First not all the people want´s or believes that needs autonomy Due to the fact that most organizations and managers do not allow people to think and they are just told what to do. Some people may not be used to this kind of freedom. Second, when an employee is showing engagement and is actively participating with ideas, proposals, etc. We should´t kill that initiative, by saying things such as "No, thats a bad idea" or "No we don´t have budget" or even "No, we tried that and didn´t work" and don use the famous "No, that was invented somewhere else and won´t work here". Because, if that employee is motivated, eventually will start thinking that there is no point for proposing improvements if he/she is constantly rejected. If we have budget constraints and the idea requires investment, the right thing to do is to work with the employee to figure other cheaper available options. If the idea may not be the best for customers, don´t just say no. Work with the employee so he/she can realize the idea is more likely to harm the client, and coach him to come with a better new proposal that could be a win - win type solution. Second, is mastery. When we do things over and over, eventually we become masters in what we do. One good strategy I followed in the past was to use those masters to teach and coach others, to achieve two things: engagement from the "master" as he is instructing other rookies. And second show appreciation and respect for the "master´s skills" so he could help me to teach less experienced ones. By that, they become some sort of authority in the organization. Third is purpose. When we know how our work impacts the organization, how our work impacts the client, and how our work is appreciated by our bosses we start to understand and find purpose in what we do. This is a hard one. My experience has shown me that by sincerely talking to employees, getting to know them, understanding their skills and passions, we can better use their talents and assign them challenges on a continuous basis so they could feel appreciated and find purpose beyond their daily responsibilities. It is the managers job to be aware and sometimes simply ask what employees like and dislike about their job. As an example I am very skilled in powerpoint, I can do amazing presentations in PPT. How ever, even though I often have autonomy over my presentations, and I have mastery, for me the purpose of a presentation often adds no value to the organization or even a customer. However mapping processes or creating lean systems is something that I like because I can have autonomy to create and use the tool i find better for the process. I believe I have mastery on doing that and i know that by creating and implementing a lean system will help the organization to improve its efficiency, eventually its costs and will be a contributor to keep the business alive; I have purpose. In my mind, that gentleman complaining about labor and unemployment attrition, instead of thinking that´s the way things are, should be thinking a way to engage personnel so they don´t want/have to leave somewhere else. Showing respect for people is the best way to engage them and ensure your labor turnover/attrition is low. If you engage your employees in continuous improvement, eventually they will get addicted to it. They will start thinking better ways to do things and will achieve innovation and improvement momentum. Just be careful. I´m not saying that employees shouldn't be paid well. In fact if you try to engage people, but they aren´t perceiving their salary being enough to cover their basic needs, eventually will leave because their needs aren´t obviously covered. So take care of their needs first (short term) but think ways to engage them (long term) so, no matter if other companies want your talent, employees will find so infatuated with your company that will find it hard to leave. That isn´t easy. But once you get it, is a powerful tactic to become a more efficient, leading company in your market. Remember that having the right engaged people, is one key input for your organization to deliver and exceed what the customer needs. What is your take on this matter? What is your proposal to diminish attrition on a very competitive environment? Please leave a message, I´d love to read your thoughts.